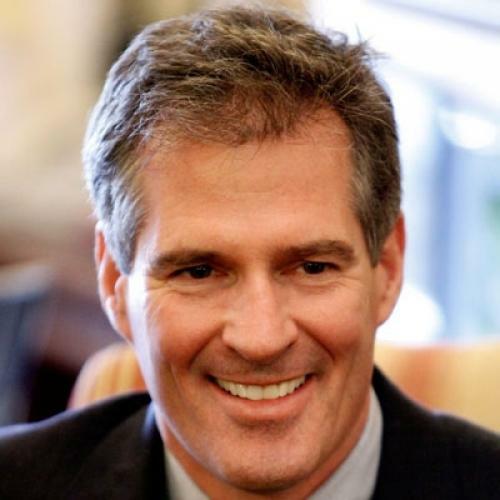 Why Scott Brown is the key to U.S. politics. There are moments when Scott Brown evokes a 12-year-old boy who woke up one day in a politician’s body—as if the Tom Hanks character in Big had asked that fortune-telling machine for a Senate seat. He certainly has the 12-year-old’s vernacular. Stumping for John McCain at a small Christian college in March, the junior senator from Massachusetts opined, “If you told me five months ago that I'd be standing here in front of you, I would say, ‘You're full of it.''' He also has the 12-year-old’s gee-whiz sensibility. After learning that he’d made Time magazine’s list of the world’s 100 most powerful people, Brown exclaimed to The Boston Globe, “I didn't realize it was in the world. … Lady Gaga's number four, so let's be real.'' As a senator, he seems most excited by activities that appeal to the prepubescent mind. “As soon as his hip gets better, we're going to do some bike-riding,'' he said in April when asked about his relationship with his new buddy, John Kerry. In fact, Brown is almost certainly understating his influence. As the 41st Republican in an institution that requires 60 out of 100 votes to pass legislation, he’s had the power to stop, or at least massively slow down, everything from health care to financial reform. But Brown actually looms much larger than even this calculus would suggest. In his concerns, priorities, and, maybe most important, his confusion about the economy, Brown has come to represent the average voter in 2010. If Democrats are going to be successful this November, they’ll have to figure out a way to seize the territory that Brown currently holds. A recent Globe poll illustrates the point nicely, crowning Brown the most popular politician in his overwhelmingly Democratic state. According to the poll, Brown’s favorable/unfavorable split is 55-18, versus 52-37 for Kerry and 54-41 for Barack Obama. Brown accomplishes this feat on the strength of his appeal to independents (55-11) and a surprisingly robust showing among Democrats (41-32). Given that Democratic candidates are highly unlikely to win many Republican votes this fall, they’ll have to limit their defections among Democrats and carry independents in order to hold Congress. Judged against Brown’s performance in Massachusetts, they are currently failing at this task. Granted, Brown’s celebrity explains part of his appeal. He was a nobody who, against all odds, won what was effectively a two-man race with the president in January—with the whole world looking on. The sheer cinematic quality of this victory—and, let’s face it, his good looks—made him a household name. Still, it would be a mistake to dismiss Brown’s popularity as a function of his checkout-counter-mag cache. In fact, Brown has been following a simple formula for building public support as a Republican: Toe as right-wing a line as you can without alienating the political middle. To take the subject of his interactions with Tim Geithner, Brown has used his influence as a pivotal Senate vote to extract loopholes for financial firms (like easing restrictions on their investments in hedge funds) and to beat back a tax on big banks. But, in the end, there’s little doubt he’ll embrace the financial reform bill. In a recent NBC/Wall Street Journal poll, voters said they’d be more likely to back a member of Congress who supported the bill by a 53-29 margin. (There’s no polling data available for Massachusetts, but the margin would presumably be even more skewed there.) No surprise, then, that Brown told a local TV station over the Fourth of July break that “he’s liking what I see” on the final compromise. Brown’s approach to the economy is far more interesting. When the NBC poll asked respondents what the federal government’s top priority should be, “job creation and economic growth” ranked first with 33 percent, well ahead of “the Gulf Coast oil spill and energy” (22 percent), and the “deficit and government spending” (15 percent). Predictably, Brown has sometimes supported legislation that would ease voters’ concerns about jobs. One of his first acts as a senator was to vote for a $15-billion Democratic measure giving companies a payroll tax-break if they hire unemployed workers. More often, though, Brown has used voters’ labor market anxieties as cover for opposing legislation, not supporting it. Like other Republicans (and some Democrats), he protested during the health care debate that Congress should fix its attention on jobs instead. In June, when the president invited him to the Oval Office to take his temperature on cap-and-trade, Brown replied that he wanted to keep the focus on jobs. And so on. Perhaps most intriguingly of all, Brown has sometimes exploited anxiety about jobs as a reason to oppose … jobs-related legislation. In doing so, he’s picked up on a paradox that defines the political zeitgeist: Even though Americans are more concerned about jobs than anything else, they don’t seem to appreciate the factors that help create them. In the same NBC poll in which voters overwhelmingly say jobs should be the government’s top priority, they also say, by nearly a two-to-one margin, that they’d prefer the government attend to the deficit even if it delays the economic recovery. So, according to the poll, voters care much more about jobs than the deficit, but much more about the deficit than the economy. Where exactly are the jobs supposed to come from? In a similar vein, a recent ABC/Washington Post poll finds that the number of people who think the stimulus has either hurt the economy or had no effect is about twice as large as the number who say it’s helped. So even if voters believed economic growth would lead to job creation, they wouldn’t view the stimulus as having helped in this regard—this despite the fact that the non-partisan CBO and most private sector forecasters credit the stimulus with boosting GDP growth by several percentage points and creating or saving well over a million jobs. Whether Brown and his aides have poured over this data, or (more likely) Brown simply reflects the same confusion* as the average voter, he’s navigated this paradox masterfully. In mid-March, he hatched the idea of opposing an extension of jobless benefits unless it was paid for using stimulus money. Translated into reality, the position amounts to the following: Brown refuses to help the jobless unless we pay for it with money that’s been allocated to create new jobs. But Brown has managed to sell this dubious logic as something completely different: Take money that’s being wasted, or worse—Brown shrewdly refers to not-yet-spent stimulus money as a “slush fund”—and re-route it to jobless benefits. Alas, Brown’s position is currently carrying the day in the Senate, where Democrats couldn’t muster the 60 votes they needed to pass another extension of unemployment benefits before the Fourth of July recess. As a result, some 2 million people missed benefit checks they’d been counting on. It’s a massively frustrating state of affairs. And, to his credit, Majority Leader Harry Reid has been aggressive in calling out the GOP for its intransigence. "We'll be back to haunt [Republicans] for what they're doing to people who are in such desperate shape,” he said after one vote. But unless Democrats can find a way to dislodge Brown from his high ground, I’m not confident they’ll make much headway politically, even if they eventually pass the measure. As another Massachusetts politician is reputed to have said, I can’t believe we’re losing to this guy. *To be fair, there’s some debate about the efficiency with which the stimulus money boosted the economy. For example, the government could have gotten more bang for its buck by upping the amount of money it sent to cash-strapped states instead of, say, providing affluent voters with alternative-minimum-tax relief. (Though that was a non-starter politically thanks to the opposition of key Republican senators.) But there’s a basic consensus that the stimulus did boost the economy and employment. And, in any case, the efficiency argument is a separate argument from the one the GOP typically makes, which is that the stimulus failed because unemployment went higher than the administration said it would. That’s true as far as it goes. But we now know that, at the time the stimulus was being constructed, the administration’s forecast for unemployment was much too low—or put differently, the situation was much worse than anyone realized. So the stimulus kept the unemployment rate from going significantly higher than ten percent, which is where it was clearly headed without the stimulus.